Follow these tips to level up fast in Pokémon Go. This guide offers several tips to help players earn XP and level up fast in Pokémon Go. Gaining levels increases the chances of finding stronger and rarer Pokémon in the wild. Players are also rewarded with free consumable items for each level achieved. In Pokémon Go, increasing one’s trainer level is an essential part of finding strong Pokémon who can hold their own in Gym battles. As you level up, you’ll encounter stronger Pokémon in the wild that have higher Combat Points (CP), meaning you won’t have to spend as many resources to power them up. Leveling up also increases the chances of capturing rarer Pokémon species. Plus, you’ll receive free consumables each time you acquire a new level, such as Poké Balls, Revives, Lure Modules, and various other items. Catching Pokémon is your most steady source of XP in Pokémon Go. An additional XP bonus is rewarded on top of the capture reward whenever you catch a new Pokémon species that was not previously in your Pokédex. Lucky Eggs are consumable items in Pokémon Go that double your XP rewards for 30 minutes. 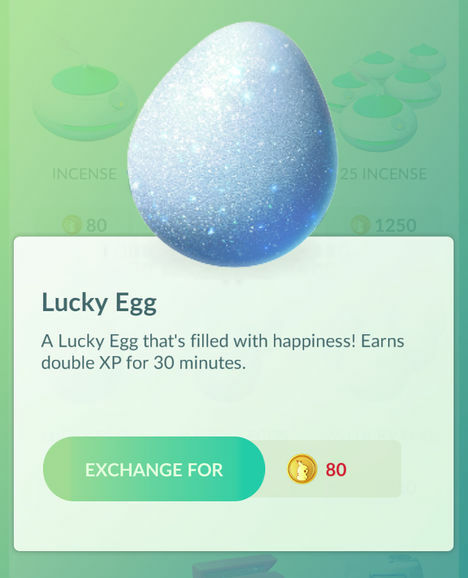 To get the most XP, use a Lucky Egg just before performing a series of high XP tasks, such as evolving or hatching Pokémon. Plan ahead by making sure you have enough Candy to evolve several Pokémon. Incubate multiple Pokémon Eggs until they are just about to hatch, and then head to your favorite PokéStop. Use Lucky Eggs to maximize your XP gain for 30 minutes in Pokémon Go. Activate the Lucky Egg, then evolve the Pokémon you had lined up. Walk to hatch your Pokémon Eggs, and continuously check in at the PokéStop. If you have a Lure Module, drop it at the PokéStop and capture as many Pokémon as possible. With this method, you can earn thousands of XP points by the time the Lucky Egg wears off. Pokémon Eggs offer a decent XP bonus when hatched, so you should always keep some Eggs in incubators at all times. The incubation process requires little more than walking around. If you are already out capturing Pokémon anyway, you can double your efforts by incubating Eggs at the same time to earn the most XP. Additional XP is rewarded for capturing wild Pokémon with a Curveball. Since the 0.31 update, players have reported that Excellent, Great, and Nice precision throws no longer grant an XP bonus. Curveballs, however, still offer a small amount of additional XP. To throw a Curveball, swirl the Poké Ball to hook it in the direction you want it to curve just as you launch it at the Pokémon. Aim to the opposite side of whatever direction you curved the ball in order to land on the Pokémon in the center. Now that you know the best methods for earning XP and leveling up, your next goal is to win battles and join gyms in Pokémon Go.